Six handwritten letters from Princess Diana have sold for £15,100 at auction. One candid letter from Diana to ex-Buckingham Palace steward Cyril Dickman, revealed Prince Harry was "constantly in trouble at school". Another note described how young Prince William "swamped" his baby brother with "an endless supply of hugs and kisses". The letters form part of about 40 lots from Mr Dickman's former estate, which sold for £55,000 in total - exceeding the estimate price of £13,000. 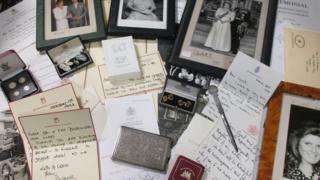 Cheffins, a Cambridgeshire auction house, said the lots were "a unique collection of royal memorabilia". Bidders from as far away as Australia, Japan and the US were trying to purchase the items. Media captionAuctioneer tells the BBC that the bidding was "extraordinary... [it] never seemed to stop"
In a letter on headed Kensington Palace paper dated 20 September 1984, Diana thanked Mr Dickman for "such a lovely card" following the birth of her youngest son, Harry. She wrote: "William adores his little brother and spends the entire time swamping Harry with an endless supply of hugs and kisses, hardly letting the parents near!" That letter sold for £3,200, having had an estimated auction price of £400-600. In another, dated 17 October 1992, Diana says how both young princes "are well and enjoying boarding school a lot, although Harry is constantly in trouble!". This sold for £2,400 - after an estimate of £600-900. The items were being sold by the family of the late Mr Dickman, who was head palace steward for more than 50 years. Described by Cheffins as "a favourite of every member of the Royal Family", he received handwritten notes from other senior royals dating back more than 30 years. The collection sold at auction also included letters, cards and photographs from Prince Charles and Princess Margaret, and Maundy money. In one letter from the Queen written on Windsor Castle headed paper, she thanks Mr Dickman for his "thoughts and sympathy" following the death of the Queen Mother. More than a dozen Christmas cards, including some from the Queen, Princess Diana and the Prince of Wales, were bought for £2,200. Unopened boxed wedding cake from the Queen's marriage to Prince Philip in 1947 also sold for a few hundred pounds.